Old Navy keeps the fun in coupon hunting for fab deals! Now, that OldNavyWeekly.com is going away, Barker, Mannequin’s best friend, will help you sniff out great offers at Facebook.com/OldNavy. “Barker is Gonna Throw You A Bone” when you dig up deals in his backyard of savings starting 4/1! Just click on the “Barker’s Bones” tab at the top of the page and start to play. You can dig up one-time use like $10 off $50 or $50 off $100 at Old Navy. 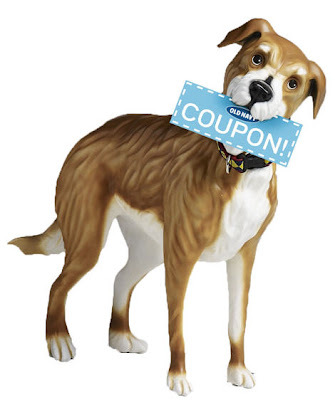 Score one lucky dog of a deal each week!